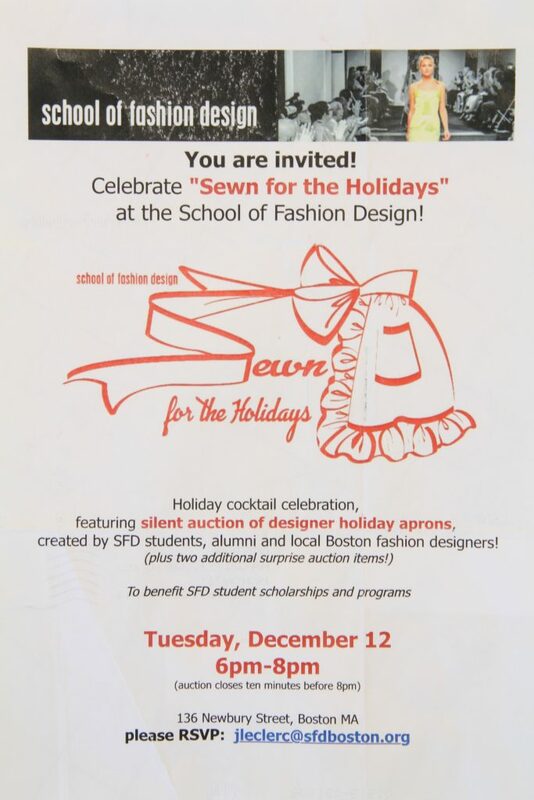 The School of Fashion Design in Boston, where I went to school and later taught, has added a December couture detail garment auction to its annual calendar. This year’s garment to be embellished is an apron. I was asked to make an apron for the auction; the apron is due December 1, 2017 for the auction on December 12, 2017. Here is rumpled flyer; it’s been through the USPS to get to me. As I have mentioned before designing is not my strong suit, so I set up a Pinterest board about Aprons. 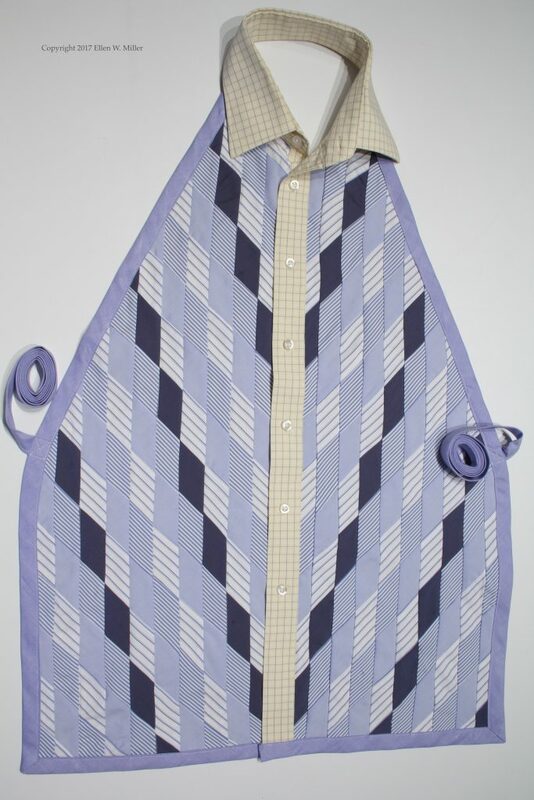 https://www.pinterest.com/coutureellen/apron/ I wanted my apron to be useful: machine washable & dryer-able.On the Pinterest board were photos of apron made from shirts. My husband recently cleaned out his closet and a bag of his shirts was waiting to go to the thrift store. 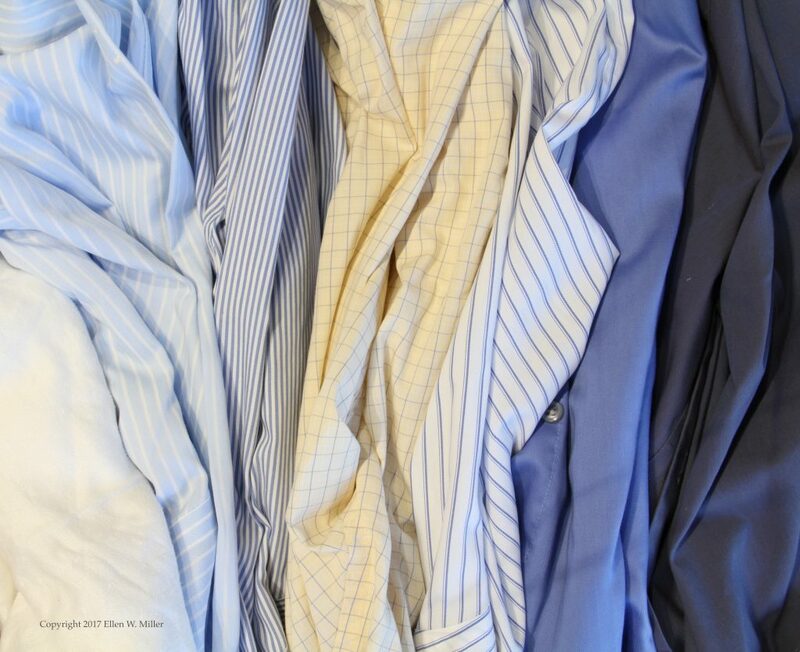 There is a standing joke in our house: which blue & white striped shirt will he wear today? 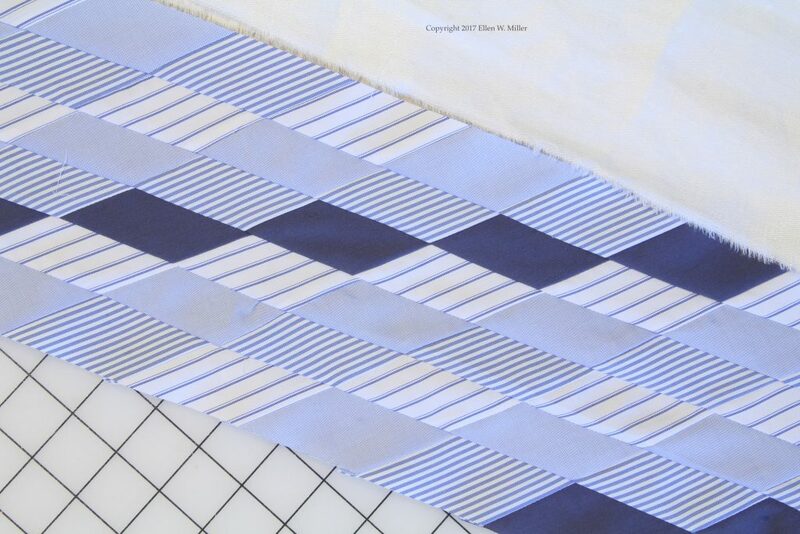 Blue & white stripes and Seminole patchwork could work! First step: cut the shirts into 2” (5 cm) wide strips. Second step: create an order for the strips. Did I create an easy to replicate repeating order? No, of course not. Third step: cut the strips into angled strips on a 45° angle. 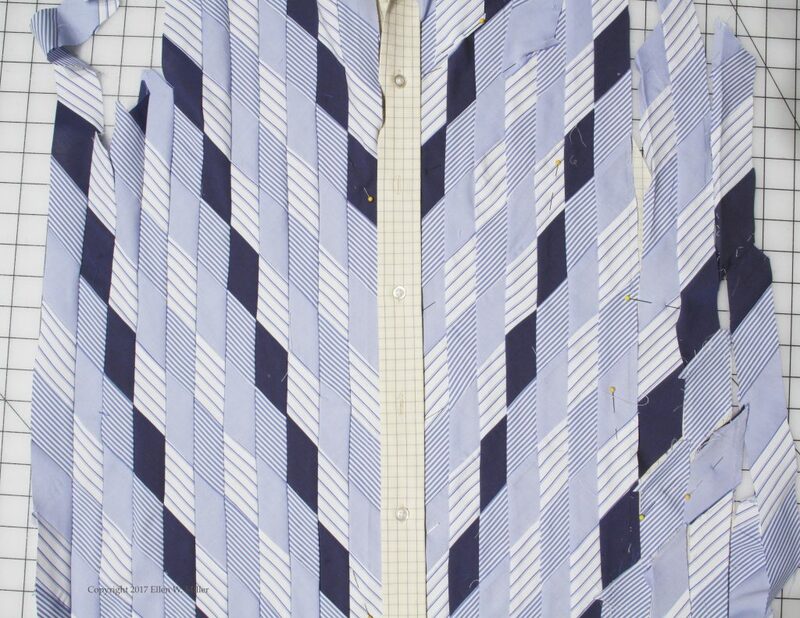 Working on the base shirt: I cut away parts of the yellow and blue checked base shirt leaving the fronts shaped into apron-like pieces with the collar. I opened up the collar stitching from the edge of the button placket around through the back neck and forward to the other front placket. I also opened up the stitching on the buttonhole placket that attached it to the shirt front. Sixth step: Place the strips on the base shirt. When I made the set of strips for the right hand side I had to cut all the strips in reverse to get the diagonal pattern to mirror the left hand side. All good. But when I laid the strips out and sewed them together I saw that I had added an extra set of narrow blue striped blocks into the pattern. I took apart the blocks around the narrow blue stripes, laid it out again and the pattern still didn’t work. I asked my husband to come help. His verdict: I was missing the narrow blue striped blocks. Argh! We placed all the blocks in the correct order and I pinned them into place. Then I took photograph below. This photograph shows the missing pieces on the right hand side, as you look at the photograph. After looking at the photograph I decided I could still get mixed up so I numbered all the pieces to be added: the strips/columns (vertical) were labeled 1-11 and additions were numbered A-D using bits of masking tape. Columns 1 and 3 just got numbers as they were complete. All the other columns got numbered and lettered A through D as they needed pieces added. I didn’t think to take a photograph of this, but I labeled the photo in Photoshop; I hope the numbering is visible. Column 11 didn’t exist, so I hadn’t screwed up that piecing! The next steps have no photographs. 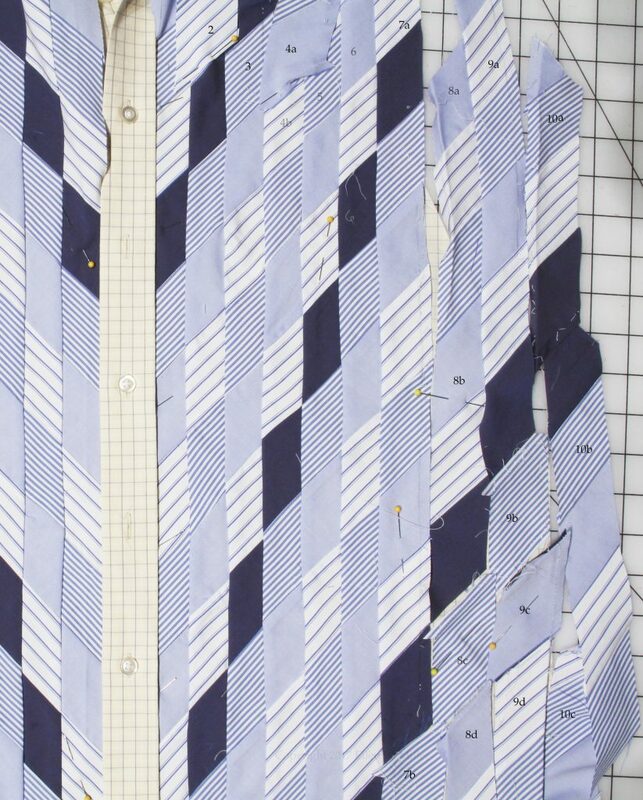 I placed the “new fabric” on top of the shirt fronts and aligned the diamond pattern, vertically and horizontally. The raw edge on the right side at center front got tucked into the buttonhole placket and then I re-sewed the placket seam. The raw edge on the left side at center front was folded under ¼” (6mm) and top stitched down to the base shirt, right next to the buttons. 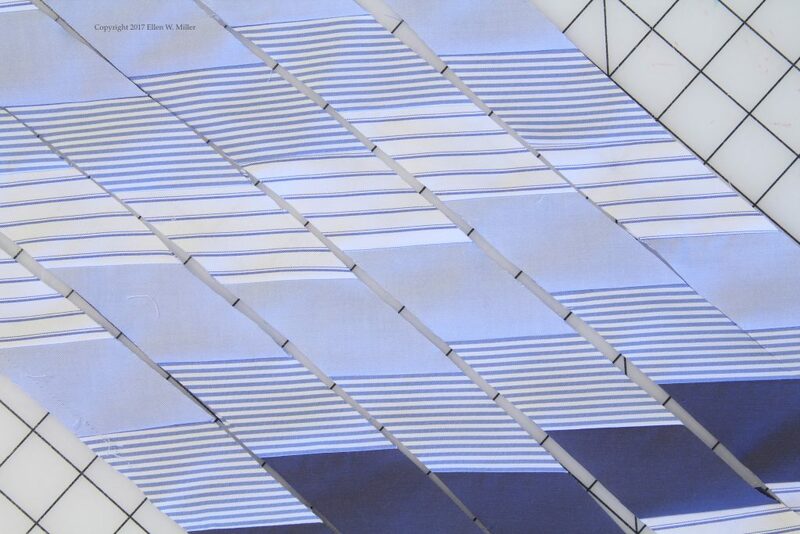 Working across the fronts I matched the vertical seams of the new fabric to a blue stripe in my base shirt, every 3” (5.5mm). These lines were then top stitched/ machine quilted to keep the two fabrics together. There are a few places where my attention wandered while I was top stitching and my stitching line went astray; I left these bobbles as it shows the garment was made “by hand” rather than by machine. OK- I was too lazy to undo the stitching. Step one hundred: I cut away the extra new fabric around the outside edges of my apron base. Now it really looks like an apron! I stitched all around the edges of the apron at 1/4″ ( 6mm) to hold it all the raw edges together. 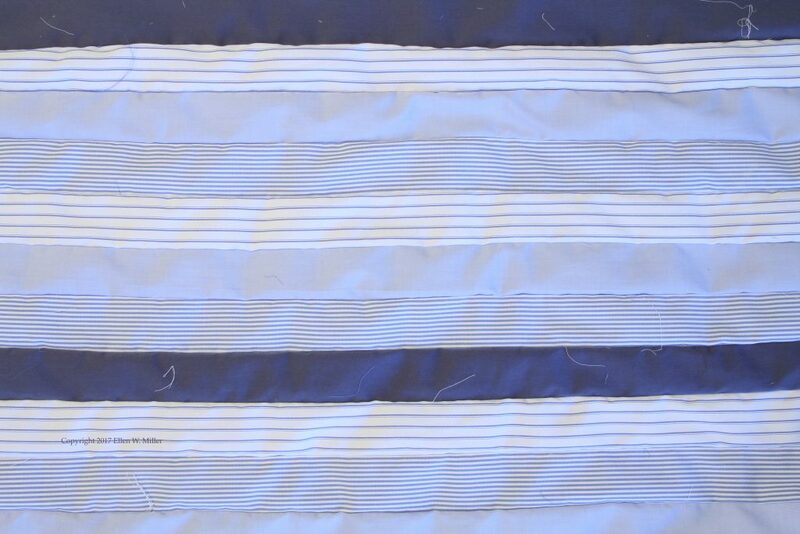 Bias binding made from a shirting remnant was sewn around the outside edges and made into apron strings. The apron strings were stitched onto the sides in big Xs. Finally the collar was re-sewn catching the top edge of the apron and closing the back neck. DONE! What I thought would be a one day project was a 2+ day project. I’ll let you know how the auction goes! Wow! Only 2 days for a materpiece!! !